Yes folks - I have been busily putting together Catalogue Launch Packs for my customers who have placed orders with me since January. They are such a lovely and valued bunch, that I decided to spoil them ! Preparing these packs was very time consuming, I'm not going to lie, but I felt the effort was worth it. 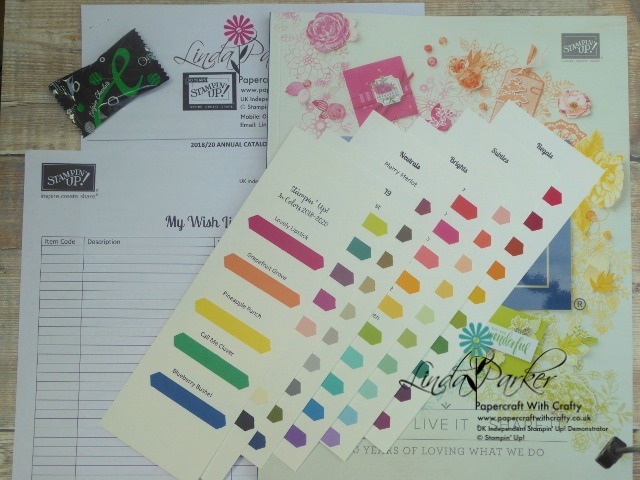 I have ensured that my little customer base will not only be receiving a complimentary catalogue from me, but also as there has been a complete colour revamp - I thought it only sensible to provide them with colour swatches of the complete range of Stampin' Up! coloured card stock. Its one thing to view them in a glossy book, but quite another to be able to touch and scruitinise the real thing. I have included a Wish List and a little Belgian Chocolate treat to be enjoyed whilst browsing all the wonderful new stock. It's such an exciting time for fans of Stampin' Up! I have received many enquiries and I am 100% confident that nobody will be disappointed with this new Annual Catalogue. Right ..... I am off for a cuppa coffee, a Belgian Choccy and another read of my catty !